A bidder in last year’s Taste for Charity auction. 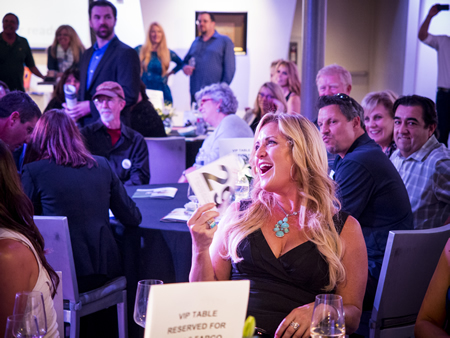 The Laguna Board of Realtors will host their 20th annual “Taste for Charity” benefit from 6-10 p.m. on Wednesday, June 3 at Seven Degrees, 891 Laguna Canyon Road. Proceeds, amounting to $120,000 last year, will go to nine local organizations ranging from the Boys and Girls Club to No Square Theatre. Tickets are $50 per person and include tastes from eight local food establishments, including Kya’s Bistro, Nirvana and Starfish, and a chance to bid on original artwork and contributions from local merchants. Cut your water bill by learning how to use washing machine water to irrigate your garden. A hands-on workshop from 8:30 a.m. until noon on Sunday, June 7, will teach and inspire participants to install their own grey water system with a cheap, easy and permit-free legal method. Topics at the Transition Laguna-sponsored class will include environmentally friendly soaps, grey water specific parts and tools. Get tickets, $27-$38 at: eventbrite.com. Participants are given the location when they sign-up for the class through the Tansition Laguna website. An American Red Cross representative will discuss earthquake and disaster preparedness at noon Sunday, May 31, at St. Mary’s Episcopal Church, 428 Park Ave. The presentation will outline steps that can be taken where you live, learn, work and play to reduce injury, damage and financial loss. All are welcome to attend. Please call 949.494.3542 to RSVP. Hallie Jones, right, plants the seeds for wilderness protection in the next generation. 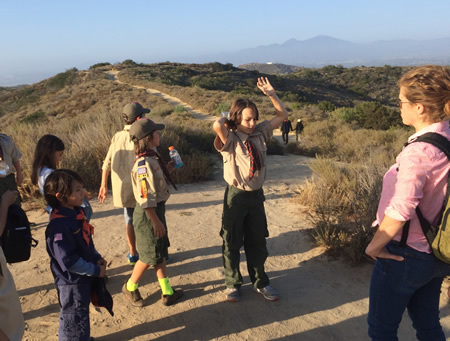 Cub Scout Pack 35 Webelo Den explored Laguna Coast Wilderness hiking trails with Hallie Jones, executive director of the Laguna Canyon Foundation starting from Alta Laguna Park. The scouts saw animal tracks, native plants and animals along the way, and were reminded not to kill the insects crossing the trail. Dylan Hamburger explains all things tomato at a garden workshop. 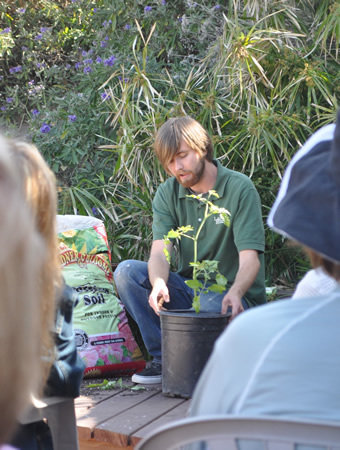 Nurseryman Dylan Bamberger returns to school gardeners in choosing and growing delicious tomatoes at a South Laguna Community Garden workshop, Tomatoes 101, Saturday, May 30, at 10 a.m. The city’s building division will provide a presentation on “Existing Businesses and Americans with Disabilities Act (ADA) Requirements” Friday, June 5, from 8– 9:30 a.m. at Nirvana Grille, 303 Broadway St. The workshop aims to help business owners understand and navigate the process of removing barriers in existing buildings. Register at lagunabeachchamber.org under events. For more info: contact Maria Ring, at (949) 497-0798, [email protected]. Local licensed insurance brokers Patrick and Joann Freeman will make a presentation on Medicare insurance plans and Part D prescription drug plans from 4-5 p.m. on Tuesday, June 2, at Ruby’s Diner, 30622 S. Coast Highway. A question and answer session will follow the presentation and individual appointments can be arranged on the spot. The Freemans offering non-biased advice on choosing a Medicare plan. RSVP and receive full apple pie from Ruby’s, 949 497 7473. Lagunabeachinsurance.com. Residents interested in serving on the Housing and Human Services Committee may apply at the city clerk’s office or on line at: www.lagunabeachcity.net. Applications are due by 5 p.m. Tuesday, June 2. Applicants will be interviewed by the City Council on June 16 in Council Chambers, 505 Forest Ave. The committee consists of seven members who serve two-year terms and advises the council on housing opportunities. In seeking images for its new website design, the city is sponsoring a photo contest about Laguna Beach among individuals who live, work or exhibit in town. Submissions are due by 5 p.m. June 12. Photographs must represent the town’s vibrancy, vitality and livability. Winners in youth and adult categories will receive recognition and a cash prize; first place, $150, second place, $75 and third place $50. Rules and entry information at: lagunabeachcity.net.